Kitchen renovations are fun. A lot of fun... I mean this in both literally and sarcastically. Living in a non-functional, falling apart kitchen is no fun. You know what else isn't fun? Washing dishes in your bathtub... However, it's a necessity and it means you're one step closer to your new kitchen! With our kitchen out of commission for the last few months, I wanted to share with you how we coped. Renovating kitchens are expensive and we did not want to compound that expense with eating out every meal. Both my husband and I are very health conscious and have dietary restrictions (he can't have dairy and I can't have gluten - wanna come over for a dinner party? hehe...) so dining out is always a bit difficult for us anyway. We have managed to eat 90% of our meals at home with a basic, temporary kitchen. We set up our temporary kitchen in our dining room and it includes our refrigerator, a bakers rack, countertop microwave, coffee maker, toaster, electric skillet and toaster over. We had all of these items on hand with the exception of the electric griddle. We bought this one and we love it! Honestly, it's probably one of the best $30 investments we've made. I have no doubt we will continue using it after the renovation is complete. We use it as a griddle for cooking eggs, bacon, hash browns, etc. but also as a basic skillet/frying pan. We've sautéed veggies, made stir fries, cooked steak, burgers, ground turkey, and pretty much anything else you can cook in a pan. The non-stick surface cleans in a snap. Also for those that are interested, the our backer's rack is still available and it's only $60. Eggs - Easy, affordable option that can be cooked in a variety of ways on the griddle. Ground meat - Typically affordable and quick cooking on the griddle. We generally stick with lean or extra lean ground turkey and as lean of ground beef we could find. Occasionally we throw in some ground chicken or ground lamb. Chicken Tenderloins - Smaller cut of chicken breast that can be cooked easily on the griddle. Turkey Burgers - Super easy to throw on the griddle. I will probably keep cooking them this way after we have functional kitchen as you can cook more at a time than you can with a skillet on the stove. Frozen Rice - We stocked up on microwavable frozen rice. You can usually find it on sale at the grocery store. You can usually find white rice and brown rice easily, with a wild rice blend on occasion. Microwavable Potatoes - There are a few prepackaged options here that are readily available at the grocery store. Sweet potatoes in the produce section either cut up in "microwave ready" bags or whole wrapped in plastic that is meant to steam the potato during microwaving are good options. We have also become fans of The Little Potato Company, which has a few yummy microwavable potato varieties. Toast - This is a morning staple for us. We usually top our toast with avocado (I know - so basic) or Vegenaise and tomatoes with salt and pepper. But there are lots of other options, including peanut butter and bananas! Fruit is a great no-cook option for snacks or sides for breakfast or lunch. We usually have bananas, apples and berries on hand. Grab what you like and what you'll eat. Really anything that can be cut up and thrown on the griddle is great. We've had lots of sliced bell peppers, onions, mushrooms, zucchini and squash. Frozen Veggies - Located near the frozen rice, there are plenty of good options. We usually have at least of few bags of frozen broccoli on hand at any given time. However, there are lots options, including veggie blends. For snacks, we have a lot of carrots, cucumber, cherry tomatoes or sliced bell peppers with hummus. No cooking required! Another great no cook option is salads. We have a salad for dinner about every other night. 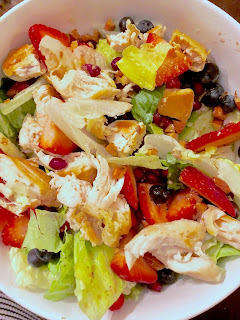 Our current favor is butter lettuce with sliced strawberries, blueberries, sliced almonds, and chicken breast tenderloins with a lemon vinaigrette dressing. Highly recommend! Now to bring this all full circle, let's talk about the elephant in the room - doing dishes in the bathtub. Just give in to it; don't fight it. I have a bottle of dish soap and sponge in a little caddy in my bathroom next to the tub. The silver lining here is that doing dishes in the tub is more efficient then doing them in the sink as you can dump all the dishes in a once. You will have to make some adjustments if you are used to having a garbage disposal. Now you don't have one. :) Be sure to scrape off as much left over food into the garbage before washing the dishes. If you don't, you will likely clog up your tub in a hurry. This is better as a two person job, so my husband and I usually tackle this chore together at the end of the day. No, I don't wash the dishes immediately. Honestly, it's just too cumbersome (and probably wastes too much water) to fill up the tub multiple times a day. We just take care of the day's dishes after dinner or before we go to bed. Well, this is how we are coping with out a kitchen! I hope that this was helpful to those of you in the same boat as us. We are getting much close to having a kitchen, however. More updates next week! Now that we’ve torn apart the kitchen, let’s talk about how we are going to put it back together! Like the rest of the home, we are going with a light, bright theme. I’ve had three years to scheme my design, and I have to say, I’m pretty happy with it. As far as the layout goes, we will maintain the modest 12×12 footprint. Due to the floorplan, we did not have an option to knock down any walls to expand to “open up” the kitchen. However, we are taking it from an L-shape to a U-shape, which will pump up the counter space dramatically. Our radiator will be moving from the north wall of the kitchen to the east wall, which will allow for the fridge to be moved to the north wall. The stove will be moved to the south wall, with the sink and dishwasher staying in their current positions. I think that this layout will be very functional and make the kitchen feel bigger than it is. Wow...it has been a while. My last post from October 2015 was taking about redoing our kitchen. Funny how life works; we are just now getting around to tackling the kitchen! We are currently in that super fun spot of things getting worse before they get better... Feast your eyes on this gorgeousness! Sadly, it look a lot of work to get to this point. Let me get you up to speed... Here is where we started. I have been investigating different sources for kitchen cabinetry over the past few months. My main challenge is that I have champagne taste on a beer budget... and I'm not talking about fancy, craft beer. I want quality and durability, but I don't want to pay for it. I'm being totally reasonable here right? My top two contenders right now are Cliq Studios and Ikea (what!?). Yup, that's right my friends, I said Ikea. Let's start with Cliq Studios. They area semi-custom cabinetry provider based out of Indiana (though I understand there is some question if the cabinets are truly made in America). 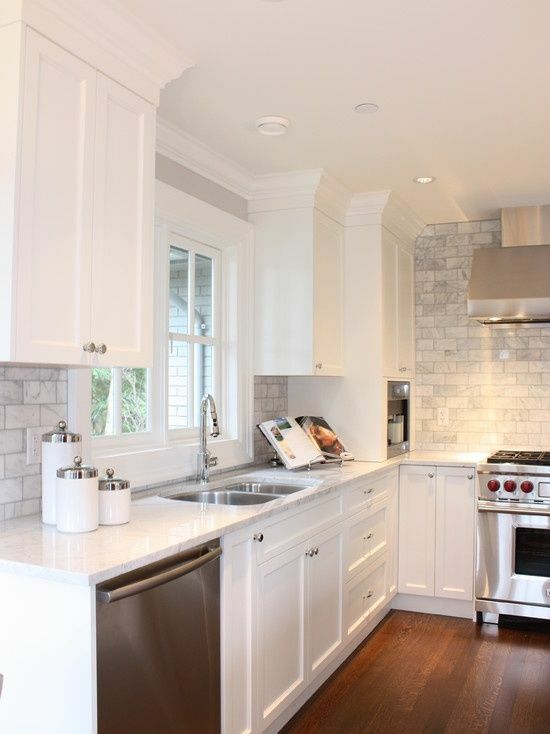 They have a wide range of cabinetry options and the cabinets come factory finished and assembled. They are extra unique, in my opinion, because they offer an inset cabinet option - their Austin style. My quote through Cliq Studios, including toe kicks, crown, etc. was about $4,500. Not bad...especially for inset! I ordered a sample door and I noticed that there was a finger print in the paint finish. Now, look, I know it's just a sample door. BUT - if you have quality control issues in your promotional products that are designed to get you sales, what happens to the quality after the sale is already made? No I am not talking about the TV show with the angry, British chef. I am talking about my kitchen. It's BAD and it's on my radar for our next major project in the house. Before I can get some serious quotes for cabinets and countertops, I need to nail down the layout. This is easier said than done because I am working with a space that is just shy of 12' x 12' with two doorways, a 3 ft radiator and a 5 ft wide window. The typical solution when you've got a kitchen like this is to knock out a wall an expand. Not an option here - I've got a stairwell on one side, a bedroom on another, the porch, and then one exterior wall (which, even if cost was a factor, we couldn't push back because the neighbor's house is too close). I've made peace with the fact that I am not going to have an 8' island in the kitchen or a 36" professional range; I can live without those things no problem. 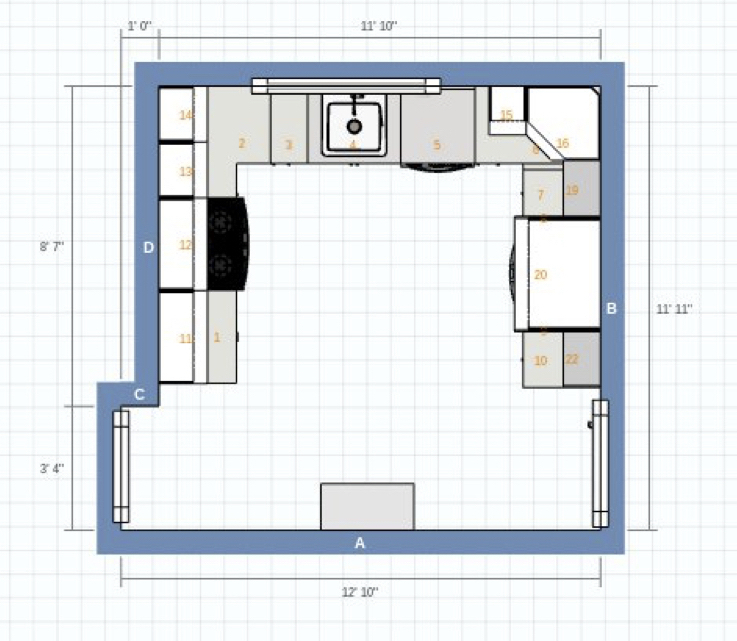 The question still remains - how the heck can you fit a functional, upscale kitchen in less than 144 sq ft!? Oh yeah, and keep the budget around $10k?